Quickly provision, secure and manage company-owned devices, tablet-based interactive kiosks, rugged devices, mobile point of sale (mPOS) and digital signage. 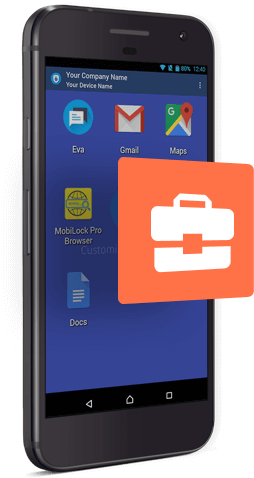 MobiLock Pro is now a certified Google Android for Work solution for Work Managed devices. The Work Managed solution set offers powerful Enterprise Mobility Management features which are tightly integrated with Android OS. MobiLock Pro enables you to leverage these features and builds on top of it to give your enterprise a seamless, modern mobile device management and application management experience. With this integration, the already proven and widely used MobiLock MDM platform, enables your enterprise Android devices to be better managed remotely, more securely and future ready. With Android for Work integration, MobiLock enables organizations to deploy an extensive range of policy controls over the company-owned devices and lock them into Kiosk Mode. MobiLock sets Device Owner mode on corporate-owned devices and gives administrators complete control of the device. Administrators can lock a device into single or multi-app Kiosk Mode and prevent access to system settings or any other apps. Deploy devices for specific employee or customer facing scenarios. IT administrators can control the lockscreen, status bar, keyboard and screen and push apps and updates remotely while restricting the safe boot function. MobiLock MDM give a better experience for your students, and less stress for your teachers. Provision and remotely distribute apps to devices from Google Playstore via MobiLock Dashboard. Silently push apps to devices and manage updates without user intervention. Browser Google Playstore via MobiLock Dashboard, discover & distribute apps. Manage all the application level permission of any apps that are being distributed by Google Playstore. Host private apps on MobiLock Enterprise Store and publish them to the devices. MobiLock offer wide-range of security policies that enables your IT administrators to keep data secure, enforce compliance and prevent data leakage. Enforce strong security policies and network configurations to protect corporate data. Remotely lock the device in case of any security incidents due to lost or misplaced devices. Perform remote wipe to prevent data loss or theft. Enforce strong password policies to protect critical company data stored on mobile devices. Monitor security breaches like someone tries to forcefully swap SIM card or exit from the Kiosk Mode. The fastest secure way to deliver content to your devices remotely. Track mobile devices in real-time set multiple geofences and view historical location data. View reports of data usage, location history & get email alerts of events related to managed devices. Remote Control provides the ability to view and control a remote Android device from the Dashboard. Looking for Android Enterprise Mobility Management (EMM)? Start your trial and discover how MobiLock MDM makes mobile device management easy for IT administrators with its simple, web-based console. Add unlimited Android devices! No Credit Card required.